Robotics has changed the world of thoracic surgery for the better — taking it to a whole new level. It gives you the ability to do a more accurate, safer surgery, no matter what you are doing in the chest. 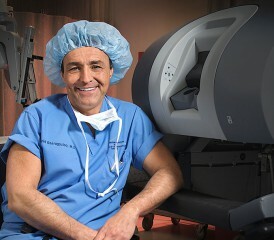 Minimally invasive robotics is performed with the da Vinci Surgical System. It involves two little hands, about eight millimeters long, controlled remotely by a surgeon at a computer board. It improves precision and maneuverability. A tiny camera provides a more magnified, three-dimensional view. We do it well at Florida Hospital Celebration Health, which is home to the Global Robotics Institute, and we probably do more of these procedures than anyone in the world today. Robotics is a fascinating topic when it comes to pleural mesothelioma. We recently had a mesothelioma patient come from England, where they aren’t doing major surgery for mesothelioma anymore. With the help of robotics here, he is back home today and doing well. The robot can play a significant role in providing a more accurate mesothelioma diagnosis, which is the final step in determining who should undergo surgery. The robot can reduce blood loss significantly during surgery, which can make postsurgery recovery much easier. The robot can help see and reach the tumor cells in the places that are hardest to reach, helping achieve a more complete resection. The robot in this scenario is a surgical tool rather than a platform, and its role is evolving still. This is not like taking out a prostate. You aren’t going to use the robot to resect a lung, and it’s not designed for that. It will, however, decrease the risk of complications. Those three areas have been a problem with extrapleural pneumonectomy, an aggressive surgery for mesothelioma, and the robot can help immensely in all three of those areas. One of the reasons major surgery has failed overall for mesothelioma is the inability to identify and pick the right candidates for surgery. The robot is really opening a new vista into understanding who should have this surgery, and who should not. Too many times, it has been done on the wrong patients. The problem is that until you get into the chest, you’re not totally sure what you will find, even after all the scans and other tests you’ve done. Too many times a surgeon will open the chest, and then realize this was not a good surgical candidate. At time of surgery, a two-centimeter incision is made and a camera is inserted to see what’s happening between the chest wall and the pleura. With the camera, you can determine whether to proceed or not. At this point, staging has not stopped. Surgery can be diagnostic and possibly therapeutic. If you like what you see, you make two more two-inch incisions and put in the robot arms. We stay in the space between the chest wall and the pleura and start peeling the diseased pleura away. It’s like a tent coming down. With the camera, you have a better chance of making sure all the disease is removed. And that is critical. They key is no disease left behind. If you’re going to leave any disease behind — and that happens with traditional methods — the surgery has failed before you’ve even started. By using the robot, you really reduce blood loss, and the complications that come with so much blood loss, which is one of the biggest problems typically. It leads to increased mortality and morbidity. With the robot, you lose about one-tenth of the blood. It’s a night-and-day difference when it comes to recovery. Thoracic surgeon Dr. Farid Gharagozloo describes how he treated a mesothelioma patient with robotic surgery. At any point, if you see something you don’t like, and you determine this is not a good candidate, you pull out and no real damage is done. Without the robot and the camera, a surgeon may open the chest and realize this was not a good candidate. But it’s too late. You’ve burned your bridges. There is no stopping then. A surgeon will move forward with this huge operation that the patient may not survive, or the surgery does nothing but hurt the patient’s quality of life. The robot can prevent these mistakes from happening. And they happen all the time without a robot. If you’re in there with the robot and you see the disease already has gone across the pleura and into the chest wall, that patient should not be having surgery. You stop. That’s not something you should find after you’ve gone into the chest with traditional surgery. By then, it’s too late. It’s all about timing with the robot. So now you know it’s resectable; the blood loss is under control; and you’ve taken the tumor cells out of the tough to reach spaces. You take the robot out and open the chest by connecting those three small incisions, and it’s a straight-forward operation — taking out the lung, pericardium and anything else you need. It’s a relatively easy surgery to do. With robotics, it is absolutely critical for a patient to go to a center doing a high volume of robotic surgeries like we do at Celebration Health. Robotics can’t be done properly by a center that is just dabbling in it. You want experience, and lots of it. Mesothelioma is such a horrible disease. The only role I see for aggressive surgery is for a patient who can go all the way. If the patient can’t go all the way, then don’t go at all. That’s important. Otherwise, you are doing more harm than good. The key point in all this is knowing exactly who will benefit from surgery, and who will not. You need the robot for that. The nonsurgical therapy that is out there, chemotherapy and radiation, just doesn’t work really well. Robotics is about tweaking the surgery to help some of these patients do well. When I worked at the University of Arizona Health Network, we did the world’s first robotic surgery for mesothelioma in January 2013. That patient is still alive and doing well today. It makes me feel there is something to all this. Dr. Farid Gharagozloo is the medical director of cardiothoracic surgery at Florida Hospital Celebration Health. While at the University of Arizona in 2013, he became the first surgeon in the world to successfully use robotics to perform an extrapleural pneumonectomy (EPP), the most aggressive treatment available for mesothelioma. Others now have followed his lead. Dr. Farid Gharagozloo is director of cardiothoracic surgery at Florida Hospital Celebration Health. He advocates the use of robotic surgery to treat mesothelioma patients. Gharagozloo believes using the robot makes for a much safer surgery and shortens the recovery time.